Tom Vorce has been a resident of O’Fallon since 2007, moving here for a career with the United States Department of Agriculture. Vorce served in the Navy for 8 years and ran a seafood store and restaurant in Virginia for 6 years prior to getting his degree in Forestry from Michigan Tech. He has been heavily involved with programs and the PTO at both LaVerna Evans and Carriel Junior High, where he recently served as the PTO President. Vorce has coached multiple sports through the O’Fallon Parks & Recreation department and currently coaches lacrosse for O’Fallon Styx. He has been involved in multiple roles within his church and been part of an emergency response team for tornados and floods. To be an alderman, “it’s only natural I would want to continue to serve and be involved in our city” said Vorce. Vorce was first to answer during the random question portion. He was asked how he would address managing O’Fallon’s current and potential growth, while still supporting existing businesses. “While our growth is expanding for sure, our annexation of new areas and lands. We can use smart placement of big box stores, things like that, to not push out the little guy. I lived this in Virginia when I had my business. We were the seafood shop in town and then Walmart moved in, so I can sympathize with them. I think it’s smart diversified growth,” Vorce said. Scharven was asked how involved in the day-to-day operations of the city he feels he should be if elected. “I don’t really think the aldermen should be involved in the day-to-day, behind-the-scenes working of who’s cutting what check, who’s talking to who. We’ve got a fine group of professionals that get paid to do that every day. I’d like to let them do their jobs first and then bring their experience and their ideas forward to the aldermen. Let other folks (aldermen) that are paid to take a look at the high-level and the big picture look at the big picture,” said Scharven. Both candidates were asked what makes them more qualified than their opponent for the position they are seeking. The ward-specific question asked of Scharven and Vorce was how should the city approach drainage issues within neighborhoods that are private property. Vorce then highlighted current areas of residential growth, future growth along the Rieder Road corridor, the downtown renovations, community events and activities and other things he feels make this a great community to live. “We work for what we care about, and I want to work to build and maintain our city for you, the citizens of O’Fallon. I have the time and concern for our community to invest in it as a member of the city council. I view serving my community as a duty, and it is one I’d be honored to serve in. I pledge to make myself available to listen to the concerns of those in ward 6. O’Fallon is a great place to live, and I love where we live,” Vorce said. A member and past president of the Rotary Club of O’Fallon, Scharven highlighted some of his service to the community. “I’m not running because I think the city’s broken. I’m running because I’m optimistic about the future. I believe I can bring a fresh perspective to the challenges we face, and I think we can do that by focusing on common sense growth. We need to take a look at the fire department and EMS and the police department. I think we need to take care of our schools…that’s the key reason people come to our community. I think we need to take care of our infrastructure. We need to be good stewards of your tax dollars, but even more so good stewards of your trust. I think I can bring innovative solutions and a fresh perspective, and I want to do this for all the citizens,” said Scharven. 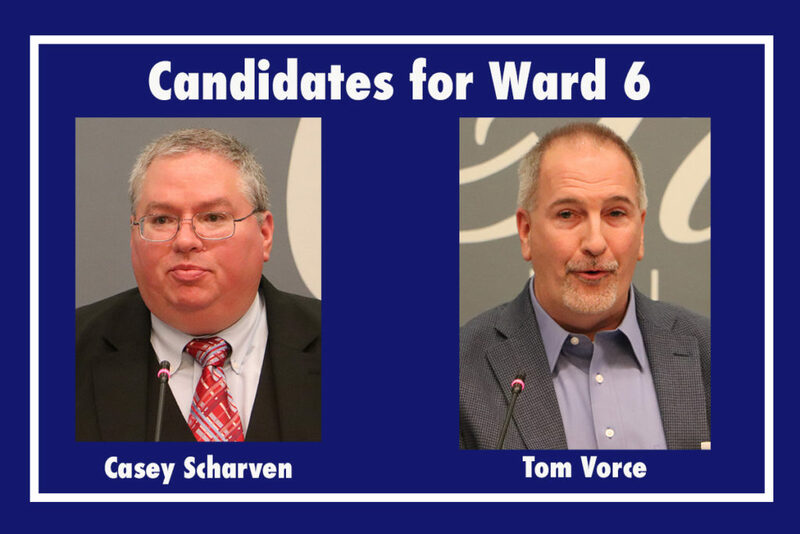 To read about the Ward 2 candidates, click here.